Look, is golf actually fun? I mean, is the game of golf actually something worth writing home about? Because with how much time Donald Trump spends hitting the old golf ball, like a goon, you would think it must be the funnest thing on the planet, right? For my money, that belongs to Super Smash Bros Ultimate, and if I was president that’s what the press would breathlessly be covering — me trying to beat Cruel Smash with Pirahna Plant and spirits off, and maybe the president has got some of that gaming fever too, because according to the Washington Post, the president has a room sized golf simulator installed in his quarters. Damn. He wouldn’t even keep the Obama video games the same. Damn. What a jerk. The entire gaming platform thing seems to play into rumors of Trump’s “Executive Time”, which fills up 60% of his schedule but is probably just him taking naps and gaming. Look, I was already bummed the president watched a lot of cable news like the lazy old man he is, but now he’s playing video games too? That’s my laziness category! Pick a lane, you lazy tax weirdo! Anyway, golf stinks, and the president should get a switch and play Captain’s Toad Treasure Tracker instead. 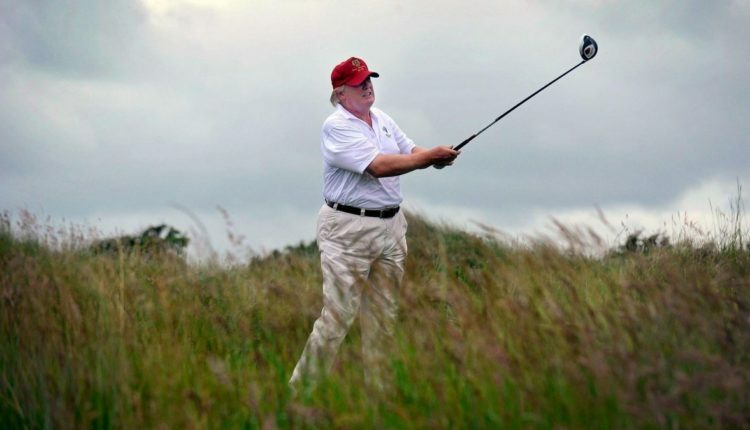 What do you think of our weird president’s weird golf hook up? Let us know in the comments or on Twitter at @WhatsTrending.